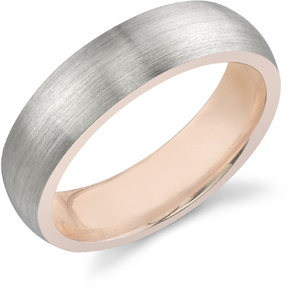 Beautifully subtle, 14K brushed white gold wedding band ring with a rose gold inner surface. When worn, the wedding band looks like white gold, but the inner rose gold is a symbol of your eternal love. Ring measures 6mm Wide and 2mm thick. Also available in 14K white gold and inner yellow gold, yellow gold and inner rose gold (shown below), or any combination of colors, by request. Also available in 18K Gold or Platinum and 18K Rose Gold. We guarantee our 14K White Gold & Rose Gold Wedding Band to be high quality, authentic jewelry, as described above.